I'm on a mission. A QUEST. To let people know about all the FLIPPING AWESOME BOOKS out there for kids. Like, I spend a lot of my spare time looking FOR books, looking AT books, placing orders for books at the library, obsessively poring over Scholastic book orders, haunting used book stores, and trolling publishing sites and lists on Amazon. Most people, I think (aside from Robyn & Whitney, Vanessa, Danzel, Leanne and Burgin) are not doing this so much. AND THAT'S FINE. Also, I haven't organized this blog so well. And I haven't done much better on Pinterest. SO I'VE CREATED THIS ONLINE SHOP. Most of the books on the blog I've talked about will be in the shop. If you've forgotten about a certain book and want to find it but don't know the title and don't want to wade through old posts, go look in the shop! I'll also have books on there that might not be on Pinterest and might not be discussed on the blog. And if you didn't know already, I love baths and tea and treats. So I have some favorites in those categories in the Cool Stuff I Like section of the shoppy. I have a bloggy and a shoppy! Loveys, I get it. The free money fairies are in short supply. I get most of my books through the library. 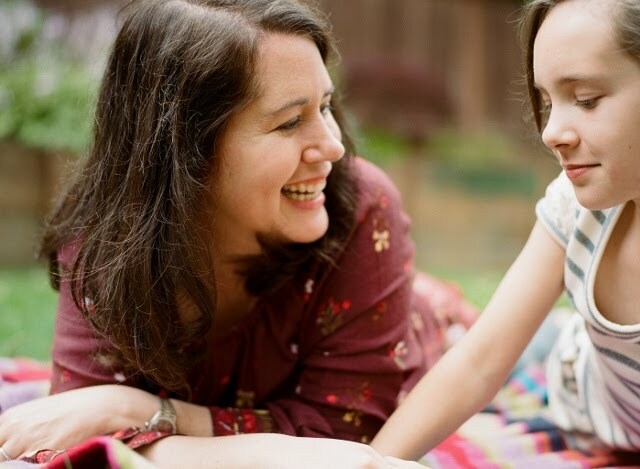 But I do feel strongly that there are great books that should live in your home that your kids should grow up with, that you should OWN. My dad has passed on his old books to me, and I am passing down to Julia, and hopefully she will pass down to her kids. So if you feel like owning some books, please do go look in my shop, and if you like, buy one, and then you will have a wonderful book and I will have 4 pennies! (Affiliate links aren't exactly a cash cow of revenue. I'm not sure they are any kind of revenue. At least they're not for me!) I've tried to only place books in there that are classics, are beautiful, are unusual, and are worth actually owning. The books that Julia and/or I have read overandoverandover. And the lists will grow and evolve as time goes on and Julia gets older. Some books in there will be out-of-print books that are only available used ~ that's ok. I order used books all the time and the ones I've received have always been in really decent condition. Oh my goodness!! This is the best thing I've read ALL day! (Internet shouting is sure to occur in this comment as well! And every sentence will end in an exclamation point it seems!) I am SO excited that you've done this. I keep pinning all the gorgeous books you feature. Now they'll be all organized for me in your shop! Yay! Congrats on setting up a shop! Fantastic- I just loved scrolling through the pages of your store and it makes me happy because I can go look there when I've forgotten a title you've mentioned that I meant to remember... but then you know, I rarely remember all the stuff I mean to. Thanks friends! I know I'm preaching to the already converted with you guys! But really, sometimes I feel like shouting from the rooftops, BOOKS ARE MAGICAL!!!! 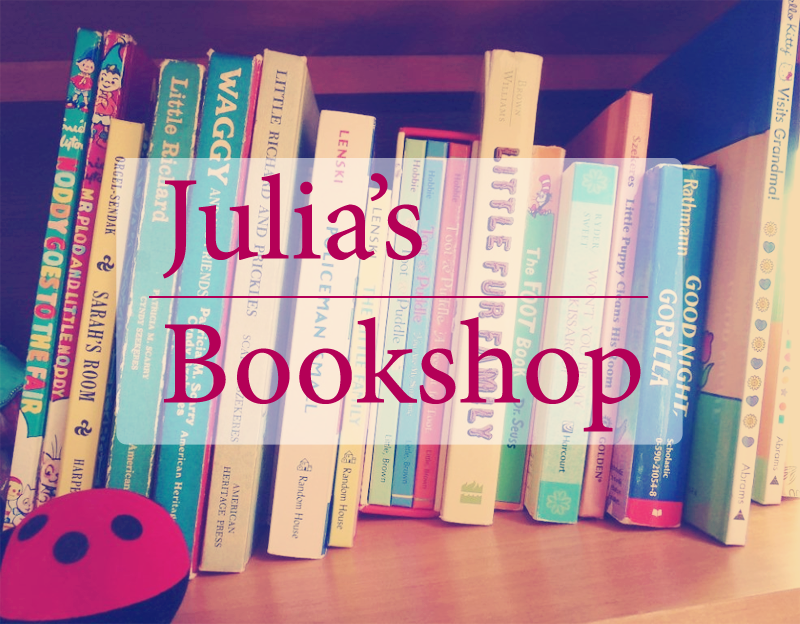 Also, here's what the blog would be like if Andrew were in charge (super funny) -- he said I should have captioned the 'find great books here' caption thusly: "Julia's Bookshop! LOL!!" He thinks everything I write should end with an LOL and a few dozen of these: !!!!!!! Ha! You beat me to it. I've started to set up an Amazon affiliate shop several times, then chickened out. (I'm weird and indecisive like that.) It's starting to look better and better to me, though... Your book lists look great, and I LOVE your Cool Stuff!!! Great idea and I look foward to shop on your your little book shop :D I am in love with books as well but the quantity of books out there is overwhelming. Always good to have a pointer! I would loooove to check out those book suggestions! Mem Fox = genius. Dorrie at witch camp for Hallowe'en sounds fantastic. Just in case you were thinking "Fluing? I keep all of my Fluing outdoors" that was supposed to be FlYing. ha ha, I DID think it was 'Fluing' and I was very intrigued by some story about the flu...:) No flu! No flu!